After spending three weeks at Leh, I came to know about the sulphur springs at Panamik, which offered miraculous cures for arthritis, digestive ailments and skin diseases. As I was already planning to visit Dikshit and Hunder, I decided to spend a week at Panamik, to study the miraculous effects of these hot water springs. Moreover, I was planning a trek along the Ancient Silk Route, which passed through Panamik and Dikshit. Panamik is situated approximately 140 km. 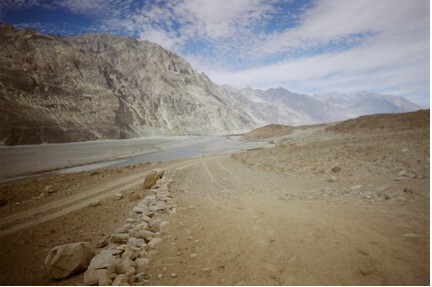 away from Leh, on the Leh-Siachen route. However, as the drive from Leh to Panamik, crosses the Khardung-La pass, this journey could take four to six hours depending on the weather, landslides or condition of roads. We started from Leh at 7 a.m. and reached Panamik at 12:30 p.m. We drove at a leisurely pace and stopped at many places enroute to take pictures of Nature’s wonders. We checked into Hiker’s Hut at Panamik, which would be my home for the next seven days. It is a simple room with comfortable beds, an attached bathroom with 24 hours hot water (an underground sulphur spring crisscrosses this Hut, providing the rooms with natural heating throughout the year and hot mineral water flows through all the taps at all times). For a vegan like me, who drinks ten to twenty cups of ginger infusion per day, it was a dream come true. Take some boiling hot water directly from the tap into a large cup. Dip crushed ginger into the water and you have an instant cup of hot ginger infusion! I carried lots of notebooks, pens, meditation tapes, ZeNLP music for relaxation, a walkman, digital camera, torch, assorted dry fruits, lots of ginger, a box of candles, several boxes of safety matches, cotton earplugs and several sets of AA and AAA batteries, in my rug sack. My objective at Panamik was to start writing the manuscript of my second book titled “ZeNLP-the power to relax”, which is due for publication shortly. I also wanted to re-examine my physical, mental and spiritual goals and write down my short and long term goals and design an action plan to implement after getting back to civil society. Shirin, my local contact at Panamik, extolled the medicinal properties of the sulphur springs at Panamik. The Chinese Turks or Yerkendis stopped over at Panamik for a night’s rest, as their caravans passed through the ancient Silk Route. The hot water at Panamik was a known cure for arthritis, acidity and stomach ailments since ancient times. Miraculous cures were reported by patients who thronged these sulphur springs from places as far away as Chinese Turkistan, Tibet and China and Afghanistan. The medicinal benefits of the hot water at Panamik are numerous. For stomach ailments, patients were asked to collect one litre of pure boiling hot water at dawn. They were asked to drink this water, after it became lukewarm. Immediately after consuming the water they were asked to climb a nearby mountain barefoot and descend the same at a faster clip. Once the patient made a slow ascent and quick descent, he would start feeling giddy and begin to vomit. It was believed that all the toxins accumulated in the digestive system over the years, is ejected by the stomach along with the vomit. This was the ancient process of detoxifying the stomach naturally. I tried this procedure twice during my stay at Panamik, and found immediate improvements in my ability to digest. Even to this day, Ladakhi women all over Leh, visit Panamik to take a bath in these hot water springs, as it is a miraculous cure for post-menopausal women, suffering from joint pains. Old men and women with severe arthritis are escorted into the bathrooms, but manage to walk out on their own steam, after the hot water bath. But experiencing is believing. After drinking endless cups of this sulphur ginger infusion, I started vomiting every morning. I could see all the oil, poisons, phlegm, mucous, bile and other impurities in my body coming out of my system. The hot water bath at dusk, used to put me to peaceful sleep with vivid dreams. I continued my ZeNLP guided meditations throughout my stay. My mornings started with music for relaxation, a healthy breakfast of boiled garden fresh vegetables, ginger infusion and fresh walnuts. Lunch consisted of potatoes roasted over a bonfire outside the Hut. There are several short treks around Panamik, which can be taken. It is advisable to let a local guide accompany you to the higher peaks. 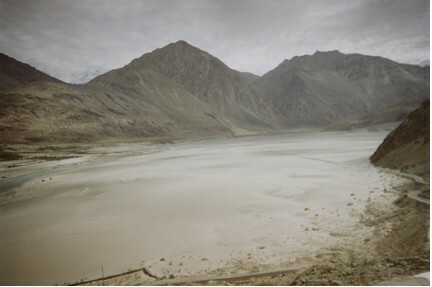 Nubra Valley is the home of Leh Berry and September is the berry collection season. One can pick up berries from the countless trees that dot the landscape all over the valley. The fruit is slightly biter in taste but juicy. It is an ideal energy booster during long treks over otherwise barren terrain. 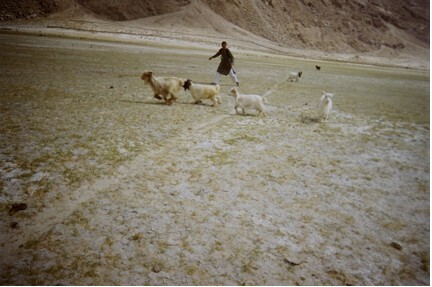 The other unique feature of the Nubra Valley, is that it is home to the double humped Bactrian camel. But one has to spend a day in the dunes to actually sight one. The return trip from Panamik to Leh took five hours. But every minute spent on the journey was a wise investment, as the week spent at Panamik, cleansed my body, mind and soul completely. My mind felt fresh, body felt more energetic and soul felt lighter after spending a week at Nature’s own spa, high among the Himalayan peaks that protect our borders. Indian Airlines operates daily flights to Leh from New Delhi, Srinagar and Jammu. The to and fro drive from Leh to Hunder costs approximately Rs.2500/- by jeep. Shared taxis are available on the return trip to Leh (Rs. 500/- per seat). District Leh is situated roughly between 32 to 36 degree north Latitude and 75 to 80 degree East longitude and altitude ranging from 2300 mtrs to 5000 mtrs above sea level. District Leh with an area of 45100 Sq. Kms. makes it one of the largest District in the country.The District is bounded by Pakistan occupied Kashmir in the west and China in the North and eastern part and Lahul Spiti of Himachal Pardesh in the south east. It is at a distance of 434 Kms from State capital ( Summer) Srinagar and 474 Kms from Manali (HP). JKTDC Moonland Guest House at Leh, adjacent to the airport is a comfortable place to stay. The Hiker’s Hut at Hunder offers minimum but clean and comfortable rooms to stay. There are very few pure vegetarian joints at Leh or Panamik. At Leh, The Punjabi Dhaba opposite New Bus Stand offers good Jammu Rajma with Rice. Pure vegetarians are advised to carry their own foodstuffs to Hunder, unless they can subsist on almonds, apricots, walnuts, apples, carrots and ginger infusion. The caretaker of Hikers Hut can whip up simple meals if the ingredients can be purchased and given to them. Fresh cabbage, cauliflower, potatoes and onions are available from the farms around Nubra valley. Fly into Leh, Allow two days for acclimatization. Drink lots of fluids. Sleep for at least 10 hours per day. Visit the local markets on the third day. Apply for Inner line permits on this day. Spend the Sunday shopping or eating out at Leh on seventh day. Carry extra sets of AA batteries for digital cameras. There are frequent power cuts at Panamik. Extra candles, matchboxes and torches come handy. There are few shops after crossing Dikshit. One of the most nature friendly spectacles at Prayag is to watch hundreds of migratory birds stopping over during their long migratory journeys from Siberia to India.